Parents in the smartphone era have all sorts of gadgets and apps to monitor, feed and amuse their kids, but when the little ones get sick, the options are decidedly low-tech. There’s nothing cutting-edge about bed rest and orange juice, and even fancy digital thermometers aren’t much of an improvement over our moms' mercury-filled ones. They may be easier to read, but they still take forever to register, especially when your kid is squirming and fidgeting while you’re waiting for the telltale beep. The Kinsa Smart Thermometer brings temperature-taking into the 21st century. While it’s not exactly a reinvention of the wheel, it reimagines the thermometer from a parent’s perspective, using a smartphones to make the process way quicker and much more informative—so much so that you’ll probably want to use it when you get sick, too. The Kinsa can plug right into your smartphone, but an extension cable is provided, which makes the phone's screen easier to see. At $25, it’s more expensive than other digital thermometers we’ve bought, but to be fair, this isn’t something you’re going to toss in a drawer and forget about. There’s a fine craftsmanship and professional feel unlike most over-the-counter health products, and we’d be surprised if it didn’t last well into our kids’ adolescent years. The Kinsa has two components. The main thermometer has a thin, flexible blue stem that extends into a smooth metal sensor that rests comfortably in your child’s mouth. At the end is a common 3.5mm plug that fits directly into the headphone jack on your compatible smartphone, but we found the included extension cord considerably cut down on the awkwardness. Once plugged in, the companion app takes over, and it’s here where Kinsa really sets itself apart from the competition. 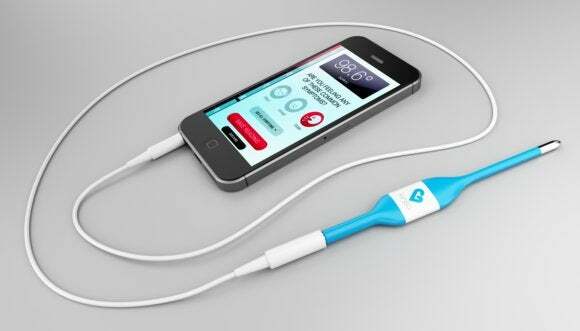 The app displays the temperature quickly, and lets you record symptoms too. Our biggest complaint with generic digital thermometers is figuring out how to get them to the point where they can actually start reading our temperature, and Kinsa’s simple, foolproof interface rectifies this. After a easy setup and calibration process—which required plugging the base unit into a separate adapter and answering a few basic questions—taking your child’s temperature is only a matter of tapping the method (oral, under arm, or rectal) and following the prompts. Once the thermometer is in position, Kinsa’s digital mercury automatically springs into action. A blue progress bar counts down the remaining seconds as a series of cartoon bubbles float across the screen—but you won’t be staring at them for too long. In our testing, temperatures were recorded within 10 to 12 seconds via mouth or armpit, a vast improvement over the 45-second average we tallied with our old-school thermometers. Consequently, it was much easier to keep our little ones from fidgeting when using Kinsa, but the animated background didn’t hold their attention for very long, particularly if we needed to repeat the process. Something more interactive would help—perhaps a simple game that counted the number of popped bubbles could be added in a future update. But we were certainly able to keep them still long enough to get a reading. The floating bubbles distract your kids while you're torturing them—er, I mean, taking their temperature. Once it’s finished, the app will display your temperature and any associated symptoms. From there you can either save the results or redo the process; we found that repeated attempts returned similar results, but readings varying somewhat between the different methods. For example, under-arm readings consistently returned symptoms associated with below-average readings, while a near-perfect healthy temperature was recorded orally. Also, too many consecutive attempts caused the app to freak out a bit, a minor inconvenience that sent us back to the main screen to start over. Recorded temperatures can be stored under individual profiles and categorized by “episode,” so little Billy’s and Jordan’s illnesses can be easily monitored. Lists are easy enough to visualize, but it would be nice to see a graphical representation of our child’s fever spikes to show the pediatrician. The Kinsa Smart Thermometer may be designed for kids, but tech-savvy grown-ups will love it, too. Just be sure to make sure your phone is supported before you buy. The Smart Thermometer makes it easier for parents to take (and remember) their child's temperature, and it's cool enough that the whole family will want to use it. Easy to track your family’s temperature history. Taking temperature is awkward without extender cord.